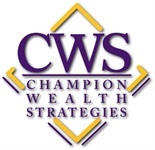 We are often approached by advisors currently employed in the brokerage departments of large banks, national and regional wire houses, insurance broker dealers, and other independent planning firms wanting to discuss the possibility of teaming up with our resources at Champion Wealth Strategies. At CWS, you’re independent, but you’re not alone. We have built a firm that gives you the advantages of independence in a high-support environment, so you can concentrate on what you do best and leave the administrative details to us. We have a competitive compensation structure based on your productivity levels. At CWS, our advisors have access to a wide variety of investment options. These investments include insurance products and alternative investments including REITs, managed futures, public oil & gas limited partnerships, etc. We offer no proprietary products thus reducing potential conflicts of interest. Our management team is available to help you in all areas of your practice management such as staffing, technology, marketing, building values in your practice, and case analysis. You have the flexibility to choose your office setting. We provide support in getting your office set up. No worrying about leases, copiers, phones, office staff, etc. If you desire to have a confidential discussion along those lines, call or e-mail Brandon Worley. *Based upon total revenues, as reported in Financial Planning magazine, June 1996-2018. As our firm has grown in both size and sophistication, we have added some very talented professional staff members to our team to help us manage that growth and deliver world class service to our clients. Although we are not currently interviewing for any open positions, if you or someone you know would like to inquire about future opportunities with our firm, kindly forward your resume to Brandon Worley.